Genuine OEM Kyocera Mita Toner Cartridge, Yellow, 7,000 page yield. Kyocera Mita part number: TK-5197Y, TK5197Y. Color Laser Toner Cartridge compatible with Kyocera Mita TASKalfa 306ci. 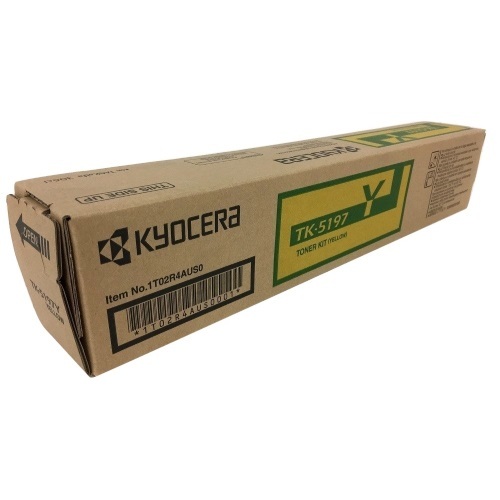 Genuine OEM Kyocera Mita Toner Cartridge, Cyan, 7,000 page yield. Kyocera Mita part number: TK-5197C, TK5197C. Color Laser Toner Cartridge compatible with Kyocera Mita TASKalfa 306ci. Genuine OEM Kyocera Mita Toner Cartridge, Magenta, 7,000 page yield. Kyocera Mita part number: TK-5197M, TK5197M. Color Laser Toner Cartridge compatible with Kyocera Mita TASKalfa 306ci. Genuine OEM Kyocera Mita Toner Cartridge, Black, 15,000 page yield. Kyocera Mita part number: TK-5197K, TK5197K. Laser Toner Cartridge compatible with Kyocera Mita TASKalfa 306ci. Genuine OEM Kyocera Mita Waste Toner Bottle, 44,000 page yield. Kyocera Mita part number: WT-5190, WT5190. Waste Toner Bottle compatible with Kyocera Mita TASKalfa 306ci, 356ci.